Sukiyaki is a type of hot pot dish known for its sweet and salty flavor, seasoned with shoyu, sugar, and mirin. In addition to thin slices of beef, common ingredients for sukiyaki include naganegi (Japanese leek), shungiku green, shiitake, tofu, and shirataki noodles. In general, the meat for sukiyaki is sliced slightly thicker than that for shabu-shabu. 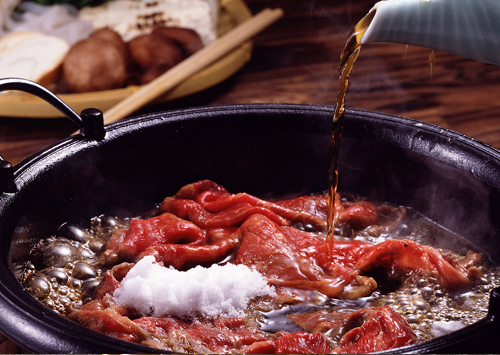 Sukiyaki is prepared in different ways in Kanto region and Kansai region. Sukiyaki in Kanto style is based on gyunabe (beef pot), which became a huge hit among people in the Meiji period as the cultural civilization was nationally promoted. A soup base called warishita is prepared with shoyu, sugar, mirin, sake and such, and meat and vegetables and other ingredients are simmered together in the premixed base. On the other hand, sukiyaki in Kansai style does not use warishita and instead cook meat first, which is seasoned with sugar and soy sauce. Vegetables are then added to the pot, and after boiling down the liquid, sake and water are added. Today, it is common both in Kanto and in Kansai to use raw eggs as a dipping sauce to eat sukiyaki, although this custom originally came from Kansai. The word sukiyaki became known to the world after SUKIYAKI, a popular song by Japanese singer Kyu Sakamoto, given a different title from the Japanese original, ranked top of the hit music chart in the United States. Sukiyaki is mainly served at sukiyaki specialty restaurants, pot dish restaurants that serve both sukiyaki and shabu-shabu, and beef dish restaurants that offer a variety of menus using beef. Sukiyaki is also enjoyed at home in Japan. Very thin slices of beef are cooked by dipping them in a boiling dashi stock in a special pot and are served with dipping sauce along with other ingredients, such as vegetables, tofu, and kuzukiri noodles, which are cooked in the soup as well. Two types of dipping sauce are generally available at the restaurant, including gomadare (sesame sauce) and ponzu (citrus and shoyu-base sauce). A variety of fish cakes, such as satsumaage, hanpen, yakichikuwa, and tsumire, are simmered with konnyaku, daikon radish, boiled eggs, and other ingredients in a dashi stock seasoned with shoyu. The word chanko originally has a general meaning that refers to meals for sumo wrestlers. To build the body, sumo wrestlers often eat hot pot dishes, which started being served at the restaurants and home. A variety of ingredients such as seasonal vegetables, seafood, and chicken are cooked together in a large pot and are served with ponzu or other dipping sauces. A block of tofu cut in bite-size pieces is placed on a konbu (kelp) laid on the bottom of the water-filled pot. The pot is heated until tofu is warmed, and the tofu is drained and served with dipping sauce. Other ingredients such as hakusai cabbage or slices of cod are sometimes cooked together. This popular hot pot for winter features crab as a main ingredient, which is cooked in shoyu-seasoned dashi stock along with vegetables such as hakusai cabbage and negi onion. Snow crabs, king crabs, and horsehair crabs are among popular types of crabs that are available in Japan. Jjigae is a Korean word for nabe (pot). This Korean-inspired pot dish cooks kimchi and lots of vegetables together with meat, seafood, or tofu in a spicy dashi stock seasoned with gochujang and hot chili powder. After most foods in the pot are eaten, it is a popular custom to make zosui by adding cooked rice to the pot and cooking it in a soup full of flavors with extracts from meat, seafood, and vegetables. Eggs and negi onions are often added to zosui. Instead of rice, udon and ramen noodles are used as well to complete the dish. Cooked on a spade or in a cedar box? Since Buddhism was introduced to Japan, eating meat had long been a prohibited behavior in the country. It was also unthinkable for people to eat meat of cattle, which was an important workforce. It is said that a word sukiyaki is a combination of suki (spade) and yaki (grill/cook), which refers to a dish of bird or fish being grilled on an iron part of the spade. According to another explanation, sukiyaki is said to have come from a word sugi (cedar)-yaki, which is another dish of seafood and vegetables stewed with miso paste in a cedar box. Although neither dish uses beef, they are thought to be the closest dishes from which the name of today's sukiyaki derived. 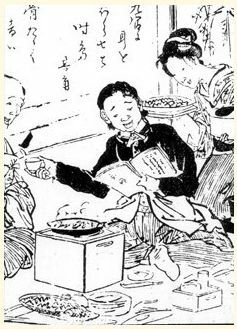 As the country reopened to the world in the 19th century, meat-eating culture was introduced to people in Japan. Gyunabe (beef pot) was considered to represent the civilization movement back then and became very popular. It is said that the dish became even more popular after people learned that the Emperor Meiji tried and enjoyed beef meat. In 1877 (Meiji 10), as many as 488 gyunabe restaurants existed in Tokyo.